Worms of the Earth is the debut album for the Italian power metal outfit, Rosae Crucis. This album is a concept album built around Bran McMoorn, King of Caledon and his fight against Imperial Rome. According to the band, their biggest influence is Manowar. A few of the other bands listed as influences are Grave Digger, Running Wild, Blind Guardian, and Rage. For their debut album, Rosae Crucis has chosen to use English lyrics as opposed to their first two demos which were recorded using Italian lyrics. Of the many influences Rosae Crucis lists, Grave Digger seems to have had the biggest influence, musically speaking. The tempo throughout the album borders on speed metal as the double bass and powerful riffs are at the forefront of the sound. There is also a prevailing "battle" theme that goes along with this album as you may have guessed from the concept that it is built around. Despite the quote that you see at the bottom of this review, there is no shortage of musical talent in this band. The guitar work is fast, yet coherent and the rhythm section is very strong. The songs are delivered with high intensity and a well rounded sound, but there is room for improvement. The lead vocalist is able to hit and sustain high notes with ease, although his delivery is rather thin otherwise. The harmony vocals could use some work, as there are more than just a few off key moments throughout. Most importantly, I feel the band needs to focus much attention on the songwriting aspect of their music. No matter how talented a group of musicians are, you must apply this talent to interesting and innovative song structures if you want to gain attention. Sure, the riffs and the rhythm section are able to hit like a speeding freight train, but the songs themselves are just too indifferent. While there are a couple melodies here and there, the album passes without any of the songs being able to stand up and make me take notice. There is a prevailing sense of redundancy that cannot be overlooked. Given that this is the band's first album I believe they took a "safe" route in their songwriting, which unfortunately results in a very "cookie cutter" sound. In such a crowded genre as power metal, a band must be able to "personalize" their sound. In the end, Rosae Crucis has proven to me that they have the technical ability to deliver the metal community a quality album. However, I feel that the guys need to develop their songwriting skills quite a bit in order to reach their potential and deliver an interesting album. It is obvious that the guys have worked hard to refine the musical abilities, so I can only guess that they will work just as hard to develop and improve as songwriters. 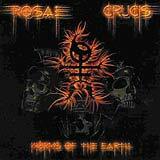 Rosae Crucis is certainly a band worth keeping an eye on.